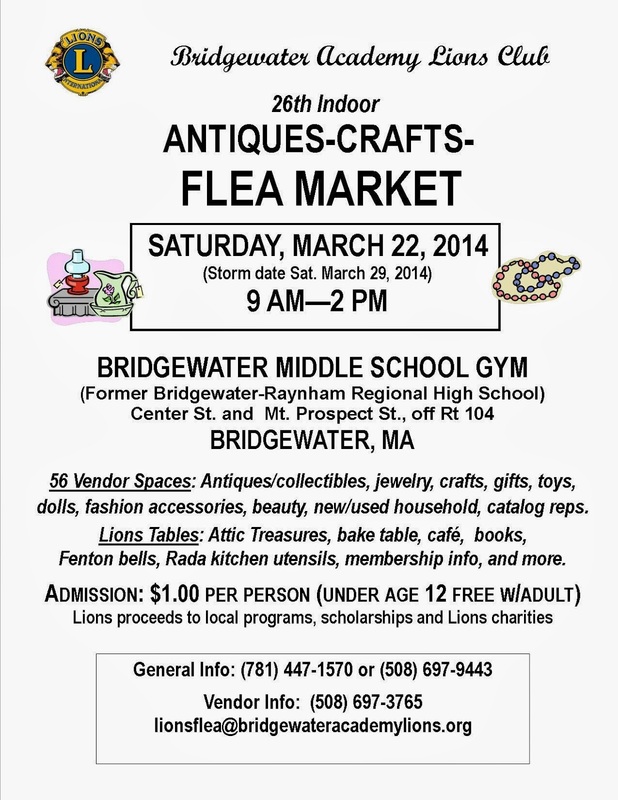 The Bridgewater Academy Lions Club’s 26th Indoor Antiques-Crafts-Flea Market will be held in the lobby and gymnasium of the Bridgewater Middle School (the former B/R Regional High School) on Saturday, March 22 (storm date March 29). It will be open to the public from 9 AM – 2 PM. The school is located at 166 Mt. Prospect Street, near the corner of Center Street, in Bridgewater. There will be 56 vendor spaces plus Academy Lions Club tables. The venue is handicap accessible from the large main parking area. This Antiques-Crafts-Flea Market will feature vendors from all over eastern Massachusetts, plus some from Rhode Island as well. The wide range of items offered for sale will include antiques & collectibles; new and vintage glass, china, and housewares; jewelry of all kinds including antique, silver, costume, and hand-crafted jewelry. Also needlework, scrollwork wood, and paperclip creations; collectible dolls, home-sewn doll clothes, and toys; candles, soaps, fashion accessories, new and used household items. The vendor area will also include representatives from health/beauty, fashion/home accessories, packaged food products, and jewelry lines. Another vendor will have military novelties, and the local VFW Post 2125 will have T-shirts and Buddy Poppies. The Lions tables in the lobby will include baked goods, attic treasures, books-music-videos-games, a café, commemorative Bridgewater 350th Anniversary bells by Fenton, Rada cutlery, and Lions membership information. The Bridgewater Academy Lions also will have a drop-off at the book table for any prescription eye glasses and hearing aids that you no longer need. For general information call 781-447-1570 or 508-697-9443. For vendor info call (508) 697-3765 or email Lionsflea@BridgewaterAcademyLions.org.